We hope you're getting just as excited as we are over here at the Wild Vibes team about spending an entire day filled with creativity and community in nature. There are so many unique offerings and incredible additions to this year's Wild Vibes Festival (including a brand new location that we couldn't be more thrilled about! ), so to ensure you get the most out of this special day, we've compiled the "Wild Vibes Guide," with everything you need to know, before you go. ✣ Location: This year's Wild Vibes Festival is held at the stunning family-owned location of SPRING HILL in South Berwick, Maine. We couldn't be more thrilled about our new, expansive festival location! The festival campground overlooks a beautiful pond with a field nestled along the forest. ✣ Parking: Although there is ample amount of parking, we kindly ask that you make an effort to carpool! Why not help keep the earth healthy and make new friends?! Parking can be found right next to the festival campgrounds, and our lovely volunteers (in tie dye!) will direct you to a parking spot! Need a ride to the festival? Visit our Rideshare group! Take a screen shot or print out the festival grounds map below so you know exactly where all your classes will be! First things first: have you grabbed your all access ticket to Wild Vibes Festival? Early bird ticket prices have ended. ALL ACCESS TICKETS ARE NOW AVAILABLE FOR $65! ✣ Did you know? You can purchase a MUSIC ONLY PASS! 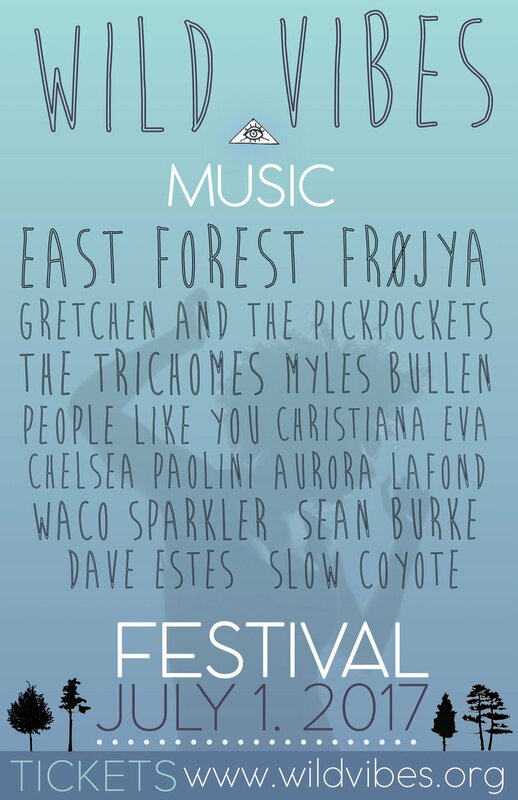 We have a killer line up of musicians and bands participating in this year's Wild Vibes Festival, and this pass gets you entry into the festival and access to enjoy ALL of the music, marketplace, and art performers! ✣ KIDS 12 & UNDER ARE FREE! With an accompanying adult, kids ages 12 and under, are free to attend the Wild Vibes Festival. Don't worry parents, while you're soaking in all the festival has to offer, your kids will be having just as much fun over at the KIDS CORNER. ✣ FESTIVAL CHECK-IN IS OPEN TO THE PUBLIC STARTING AT 10:15AM. Now that you have purchased your ticket, print it out, and bring it with you to the festival. Once arrived at the check-in entry, show your ticket to our lovely volunteers tending the ticket booth. You'll receive a colored wristband that will give you access to attend all yoga classes, workshops, and live music! ✣ The Wild Vibes Festival Opening Ceremony kicks off at 10:50AM, and classes begin at 11AM. ✣ SUP YOGA: is located at the Sea Shala. Classes run at 11AM, 12PM, 3PM, & 4PM. SUP YOGA IS AN ADDITIONAL COST (to attend you must have either an all-access or music only wristband). and is a first come first serve basis. We suggest purchasing your SUP Yoga ticket ahead of time and reserving your spot. Save the schedule to your phone or print one out so you don't miss out on a workshop, band, or class! ✣ Your Yoga Mat! >>> These travel yoga mats are ideal for carrying around and using outdoors. ✣ Sunglasses and Sunscreen >>> We suggest grabbing an all-natural kind from our good friend, Jane Gee's. ✣ WATER! >>> Stay hydrated throughout the day by bringing a water bottle. Forgot your water bottle? Don't worry! Water will be available for sale! And special limited edition Wild Vibes waterbottles available for purchase! ✣ Backpack or day bag >>> To carry your belongings and to stash your new purchases from the Wild Vibes Festival Marketplace. ✣ Journal + Pen >>> Take note of everything you learn from the Wild Vibes Workshops and the inspiration you receive! ✣ Cash/Check >>> For donations and goodies to purchase! Most vendors do NOT accept credit cards. ✣ Camera/IPHONE >>> Capture the magic of the day and TAKE A PICTURE IN OUR PHOTOBOOTH! (new this year! ), and be sure to hashtag #wildvibesfest2017 #namastewild to share photos! ✣ Proper attire >>> Wild Vibes Festival is RAIN OR SHINE! You never know with New England weather, so dress accordingly! ✣ Your sweet, smiling, wild self! ✣ Check out our FAQs page for everything else! Follow us to stay in the loop of all festival happenings! ....grab a healthy bite from Laney & Lu and The Juicery while you shop from over 50 artisans and vendors from around the globe! Then feast at the BBQ with our very own SPRING HILL RESTAURANT as the day settles into the night! There's a Corner Just for Kids at Wild Vibes! New this year! Parent & Baby Classes, Teen Vision Boarding, Toddler Yoga, and Art lessons! 2-2:45pm: It's Play Time! Hula hooping, freeze dance, yogi says, and more! Featuring a Special DJ Set From >>> EAST FOREST! A lot of love, sweat, and collaboration goes on behind the scenes into making Wild Vibes Festival come alive. These are the people that make it happen. Receive friendly updates with festival happenings and exciting things ahead for Wild Vibes >>> like the Wild Vibes MOROCCO retreat happening in February 2018. Last year's wild-ness. We're ready for Wild Vibes Festival 2017!